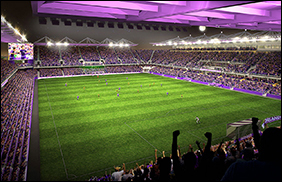 ORLANDO, FL (CelebrityAccess) — The Orlando City Soccer Club revealed plans for a $155 million, 25,500-seat stadium that will open in 2016, giving the city the most technologically advanced venue in Major League Soccer. The stadium, which is being privately financed, will take 12-14 months to complete and will serve as the home for the MLS team the Lions. The delay allowed the team to expand its planned capacity for the stadium by 6,000, in response to increased ticket sales. The new stadium will feature covered seating and an open-air terrace with dedicated standing room only space. The new design also features 31 suites (with a 90-person “super suite” and 59-person group suite), an 8,400-square-foot indoor club in the west stand, and a 360-degree concourse with additional concessions and fan amenities. The stadium will offer enhanced concessions including the ability to order drinks and food to your seat by phone.